Nearly 50 million young people will enroll in U.S. public elementary and secondary schools in Fall 2012, and 14 million of those students will enter a deteriorated school building. “An estimated 40% of the nation’s 100,000 public schools are in a ‘bad-to-poor’ condition,” Glen Earthman, Ed.D. told Parade Magazine in August 2012. Dr. Earthman has studied the link between infrastructure and student performance since 1993, and has found that children attending schools in subpar condition score up to 10 percentile points lower on standardized tests, even after controlling for poverty. Rebuilding our schools has not gotten the attention that teacher salaries and testing have. The price of rebuilding our schools is not cheap. The National Education Association estimates that it will cost $322 billion in new spending to bring school buildings up to modern standards. There is a bit of good news though. 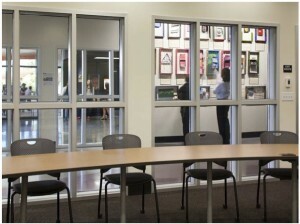 Recent studies show that it is greener and cheaper to retrofit existing school buildings than to build new. The Preservation Green Lab has published the first-ever report to quantify the advantages of reuse compared to new construction. The exhaustive study uses life-cycle analysis to look into six building types: single family residential, multifamily residential, commercial office, urban village mixed use, elementary schools and warehouses. Building operations account for 72% of the electricity consumed in the U.S., 41% of the total American primary energy consumption and 35% of the CO2 emissions. renovating an elementary school is 9-12% better for cutting carbon emissions and using fewer resources than building new. renovating an elementary school is 7-11% better for human health than building new. reusing an elementary school is 11-14% better for ecosystem quality than building new. Although these percentages may seem relatively small, when these savings are spread out over the estimated 10 billion square feet of U.S educational buildings, the environmental and climate change impacts can be quite great. “Experience has shown that it’s generally less expensive to alter and rehabilitate an existing school rather than build a new one,” wrote Pennsylvania’s secretary of education Dr. Gerald Zahorchak in 2011 in Renovate or Replace? The case for restoring and reusing older school buildings. In addition, Zahorchak finds that there are educational, health and community benefits of reusing older schools, including easy accessibility for students to walk or bike to school and preservation of high quality materials and workmanship that cannot be duplicated today. And a recent report studied the type of bond investments voters are most likely to support. 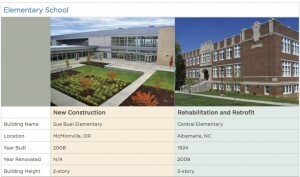 The March 2011 report by Zimmer et al finds that there is a higher approval rate for maintenance of existing facilities than the construction of new school buildings or additions. The average public school building nationwide is 42 years old. The mean age of schools in the Northeast and Central states is 46 years old. Nearly 30% of all public schools were built before 1950, and 45% were built between 1950 and 1969. Only 10% of the nation’s schools were built after 1985. When 90% of American schools were built, fire rated glass meant small panes of wired glass that could be used in limited applications. In the last 30 years, there have been incredible advances in fire rated glazing products. Today, fire rated glass and framing systems are building materials that can be used in the place of gypsum and other opaque materials to increase daylighting and achieve sustainable building design. maximize light penetration deep within a building. increase opportunities for shared artificial light and reduce electricity use. provide greater visual access between occupancies and stairwells. provide built-in fire protection that limits the spread of fire, smoke and the effects of radiant heat and preserves building components and materials, so that fewer resources, raw materials and energy are required due to fire damage. To read more on how fire rated glass helps gain LEED points and achieve sustainable design, click here.